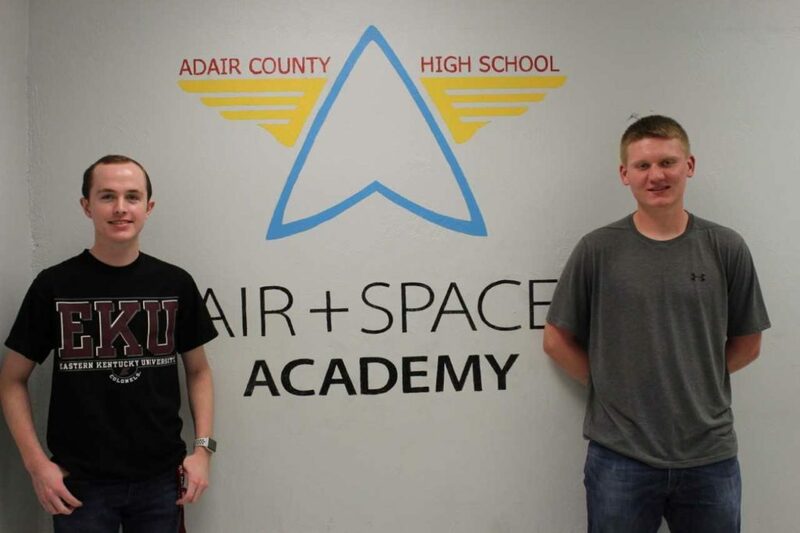 Adair County High School would like to congratulate two Air and Space Academy students, Clayton Janes and Nick Taylor, for their recent accomplishments. ACHS sophomore, Clayton Janes (son of Chris and Christina Janes) took the FAA written pilots exam on Saturday, April 28, 2018 and passed. This makes Clayton the first student in the Air and Space Academy to pass the rigorous exam. To make his accomplishment even more impressive, he took the exam two years earlier than was required. ACHS senior, Nick Taylor, (son of David and Kristi Taylor) took the FAA written pilots exam on Monday, April 30, 2018 and passed. Nick has already begun his flight training and has logged approximately 10 hours with an instructor. The following day, on Tuesday May 1, 2018, Nick became the first Air and Space Academy student to successfully solo in an airplane. Nick plans to attend Eastern Kentucky University in the fall and study to become a professional pilot. The Adair County High School Air and Space Academy is completing its third year of instruction. The academy focuses on flight/aeronautics, aeronautical engineering, and unmanned aerial systems (drones). The instructors are Matthew Willis and Keri Willis.